Since beginning my joint replacement blog several years ago, I have received many comments and questions from readers on a variety of subjects and personal experiences. For this post, I will use a Q & A format to share some of the most-frequently asked questions and concerns about hip replacement surgery (THR). I will link back to respective blog posts where applicable. I thank you all for your readership and my hope is that others will benefit from this hip Q & A.
Q: I had a left-sided THR one year ago using an anterior approach. Overall good results, but still have some nerve damage and numbness, although I believe it is returning, albeit ever so slowly. I expect that I will need to have the right side done eventually. That being said, do you usually recommend using the same (anterior) approach for the 2nd surgery? Or should I possibly consider a posterior? A: Hopefully your nerve will continue to recover. If a nerve is going to recover, it usually does so over the 12-18 months following the injury. It’s impossible to predict the completeness of the recovery. Nerve injury is most common with the direct anterior approach, with the lateral femoral cutaneous nerve commonly affected. This nerve supplies sensation to the anterolateral thigh. I would suggest if your other hip now needs to be replaced that you focus on choosing your surgeon and not the approach. If you are happy with your left THR and the care you received, then discuss with your surgeon your right hip arthritis and his or her opinion regarding your chances of incurring a right-sided nerve injury. At the end of the day, choosing who will do your right hip is a personal decision that only you can make. 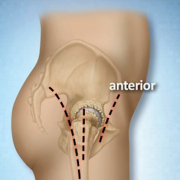 Just because you had one hip done anteriorly absolutely does not mean you need to have the other hip replaced using the same approach. Q: My 92 year old mother tripped 6 weeks ago and fractured her hip. Her very experienced surgeon performed a partial hip replacement and he says that she is doing well. She is walking with a walker and seems to gain strength daily. Two people have told me that it is not good that she got partial than total hip replacement. I didn’t know this and nothing was mentioned to me or discussed with me prior to her surgery. I am feeling concerned and troubled about this. I would appreciate your comments. A: While it is true that the very best and most predictable results are with total hip replacement, most people who have partial hip replacements do beautifully. The advantage of doing a partial hip replacement, particularly in an elderly patient who broke a hip, is a smaller risk of hip dislocation post-operatively. Also, there can be less trauma and postoperative bleeding because only a new stem with a ball is placed. The acetabulum is not resurfaced. Often, individuals who fall and break their hips have experienced multiple prior falls, where the hip was not broken. Most people in the U.S. who are treated with surgical replacement after hip fracture are treated with a partial hip replacement and not a total hip replacement. Q: I had a left hip replaced in May of 1991. I had X-rays a couple of years ago when it was giving me trouble and it showed the socket had worn about out. Surgery was recommended. I am 74 but in good physical condition. It got better so I did nothing, but after I picked up a piece of farm equipment weighing about 150 pounds I now have pain. A: I strongly recommend that you have your hip revaluated. I suspect something mechanically failed since your symptoms suddenly increased. This failure could be from the socket or metal stem frankly fracturing. Or, it’s possible that the bone that supports the cup (acetabulum) or femur broke. This can result in the prosthetics components shifting, and that can cause pain and a limp. The worn socket that was described to you a couple of years ago suggests significant plastic wear, which classically leads to inflammation and bone loss or osteolysis. This process will only continue and therefore it’s best to address the failure “earlier rather than later,” when there is more bone to work with and hence achieving a good result is more assured. It is optimal to know the manufacturer of the prosthesis so modular parts can be made available (new liners or balls). The reality is that replacement parts may not be available 25 years after your index surgery. If the stem is stable, hopefully replacement balls are still available. 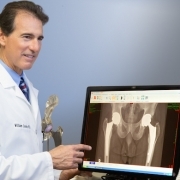 Many times, an experienced hip surgeon can recognize specific components. The staff at the hospital where surgery was done and the manufacture’s rep sometimes can be helpful. My strong advice is to now act and be re-evaluated by an orthopedist with whom you feel confident can care for you. Most general orthopedists will not feel comfortable revising a hip, particularly one that is now 25 years old. 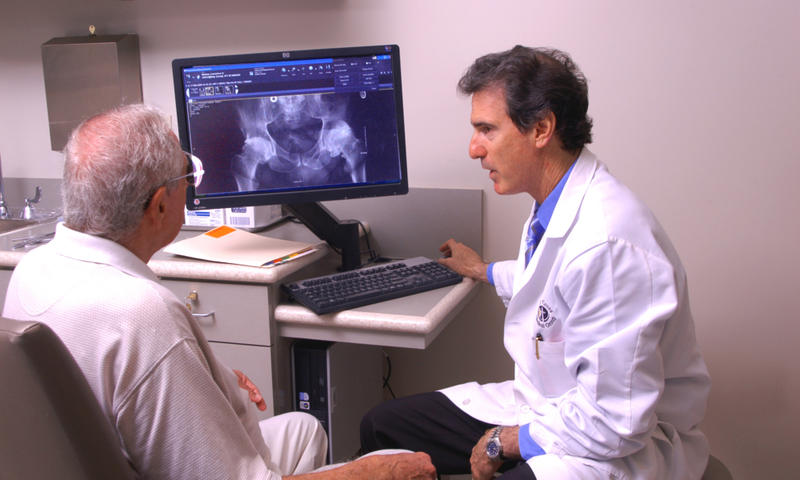 Q: I am a 70-year-old male scheduled to have total hip replacement surgery on my right hip. My surgeon does the mini-posterior method of surgery. My problem is I have a right knee that also needs replacement due to OA bone on bone condition. How will I rehab my hip (which my doctor said should be replaced first) if my knee is shot? A: Many people who develop hip osteoarthritis also develop arthritis in one or both knees. The general rule is that if both are symptomatic and in need of joint replacement, then it is preferable to start with replacing the hip. This is because when replacing a knee, one of the surgeon’s goals is to realign the knee to create a neutral mechanical axis. Imagine a weighted line that is dropped over the center of the hip joint and the middle of the ankle joint also falling through the middle of the knee joint. 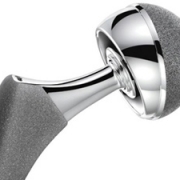 Frequently, during a total hip replacement, the center of the femoral head is repositioned. It’s best that this is done before reconstructing the knee. Another reason is that many times after a hip replacement, knee symptoms improve or resolve if all or part of the knee pain was referred pain from the hip. Relieving the hip discomfort usually results in improving the gait, which can also help diminish knee pain. Finally, the recovery after THR tends to be easier and less painful than after TKR. If TKR still is indicated, you’d be a lot more confident having had the THR experience first. Also, your hip won’t hurt. If you are struggling with rehabilitation after your THR because of your knee, your surgeon may consider a cortisone injection to give you temporary relief. Q: I am 52 and have osteophytes on my left hip, secondary to acromegaly, that create mild pain and soreness but mean that I cannot walk without a limp, which I am finding very depressing. I still have wide joint spaces and very good (full) range of movement, having been hypermobile even prior to a pituitary condition. The hip problem and walking imbalance I have had for two years now appears to be starting to aggravate the left knee. Does hip arthroscopy offer any prospect of removing the osteophytes and enabling me to walk normally again? A: If your symptoms truly are secondary to the development of the osteophytes, then a hip arthroscopy may potentially help. I would be very suspicious that the osteophytes are secondary to underlying osteoarthritis, with the joint space experiencing abnormal joint reactive forces. Usually, the osteophytes (also called bone spurs) are asymptomatic. Occasionally, osteophytes do restrict motion or cause pain when the limb in placed in certain positions resulting in impingement. You report that even now your motion is good. Q: I have been experiencing pain in left outer hip region since last March. I am 37 years old and have been an active runner for years. I have seen an orthopedist on multiple occasions who performed two cortisone injections (for bursitis), without relief. He has obtained an X-ray of my hip, an MRI of my left hip, and an MRI of my lumbar. The MRI of my hip showed gluteus minimus tendonitis. I have also presented to my family doctor with the pain, who also insists hip bursitis. A: Your symptoms do sound consistent with greater trochanteric bursitis. The treatment you’ve received also sounds appropriate. Unfortunately, greater trochanteric bursitis can be chronic and difficult to resolve. In my experience it does, however, eventually get better. I would not recommend any additional cortisone injections. These can weaken tissue. Formal physical therapy at this point may be appropriate. I would go with the goal of learning specific exercises and modalities that you can do on your own. It’s important to avoid activities or positions that cause pain and equally important to figure out what activities you can do, such as bike riding or swimming. A number of studies have looked at PRP injections. Their role is still being defined, but it is a consideration. Most importantly, I would emphasize abductor strengthening exercises and avoiding pain. Good afternoon, for a robotic hip replacement on someone with a shorter leg, what length more or less are you able to extend it to? When performing Total Hip Replacement (THR), the surgeon often is able to lengthen the operative leg. The amount of lengthening is limited primarily by the sciatic nerve. If the leg is lengthened too much, sciatic nerve palsy can result due to the nerve being overstretched. If the patient’s leg shortening developed after skeletal maturity, then the sciatic nerve also was longer at some point and typically that leg can be lengthened to a greater degree than if the leg had been significantly shorter for a lifetime (typically a congenital etiology). The possible degree of lengthening also is dependent on other factors such as soft tissue contractures and the boney architecture. Typically, most hips / limbs safely can be lengthened approximately 4 cm. Q: I have been diagnosed with hip dysplasia. My physical life is diminished and I feel handicapped. I saw a hip surgeon last year for an opinion, but because I had almost no arthritis on the X-ray, he did not recommend surgery. I am now in chronic low-grade pain that’s getting worse and don’t know what I should do. A: Hip dysplasia is a very common underlying cause of hip osteoarthritis. Imagine your femoral head lacking full acetabular coverage resulting in an overloading of the superior aspect of your socket and hence the cartilage and labrum becoming damaged and ultimately breaking down. If an MRI demonstrates no cartilage damage or subchondral cystification (the development of degenerative cysts), a repairable labral tear and minimal dysplasia, then a hip arthroscopy may be considered. Recognize that the underlying etiology will not be corrected by this procedure, so any relief of symptoms might only temporary. Honestly, most 59-year-old active women do best with a well done THR. This treatment is much more definitive and predictable. 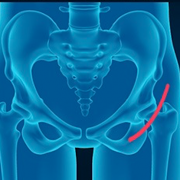 When a dysplasic hip is reconstructed to THR, it’s important the abnormal mechanics are corrected, typically by medializing the cup (positioning it closer to the midpoint of the body or bladder).This requires surgical insight and skill to accomplish. Q: I trusted my doctor but he did not inform me about femoral nerve damage when it’s occurring in roughly 1 out of every 4 or 5 people who have the anterior approach. He pushed the anterior approach because of a shorter hospital stay and that I would be back on my feet quicker. I conferred with 3 other surgeons after my surgery to see if anything could be done about my injury and they all told me in their own words that the anterior approach is no good because of the femoral nerve being so vulnerable. Thanks for reading about my frustrations. A: Clearly you’ve experienced a devastating injury which has resulted in a poor outcome. For that, I am so sorry. Although total hip replacement surgery is done routinely in the U.S., major problems and complications still can and do occur. When someone decides that the time has come to proceed with joint replacement (hip or knee), it is typically a decision based on loss of function and how he or she is feeling. Most of my patients express feelings of frustration, most complain of pain or discomfort and often a sense that they are losing their quality of life. Many tell me it’s making them feel depressed. They also typically make the final decision to move forward with hip or knee replacement when nonsurgical remedies are not giving them the relief or result that they desire. I think once the decision has been made to move forward, the next most important decision is who actually will do the surgery. I think the relationship and trust between a patient and surgeon is not only important but therapeutic. Each patient must feel that the surgeon he or she chooses is someone who they trust implicitly, based on interactions with the doctor and the office staff, the patient work-up, and that surgeon’s reputation. It also is important to look at the hospital in which the surgery will be performed. Having a thorough discussion before the surgery is vital to outline appropriate goals, to understand what to expect prior to and after the surgery, as well as any potential complications. If you are concerned about the approach to be used, then by all means go over the pluses and minuses of each approach pre-operatively. Once you’ve chosen a surgeon, then you need to trust that individual to choose the approach and prosthetic implant which he or she feels will have the best chance of delivering the most desired result. You choose a surgeon based on professional reputation and personal rapport. 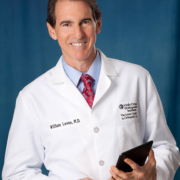 I respect and encourage my patients to become as informed as possible before their surgeries but in the end, you need to trust the doctor you choose to take care of you. Sadly, it does appear that with your reported symptoms that your hip arthroscopy was unsuccessful. 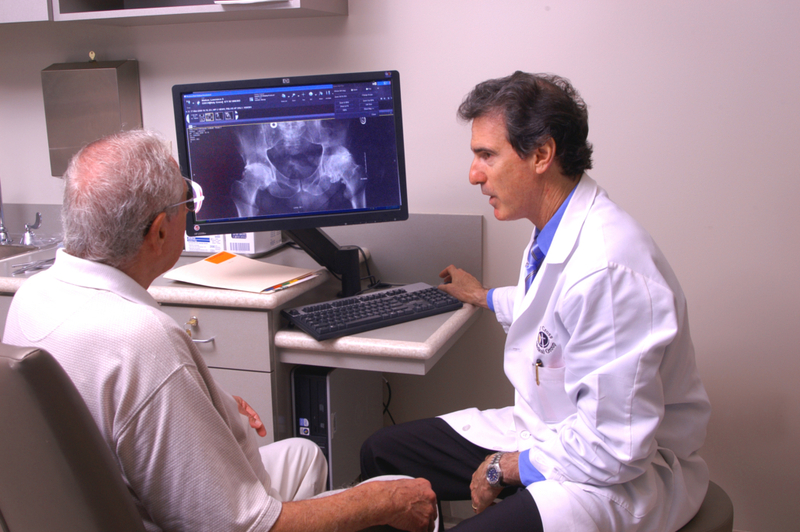 X-rays that demonstrate a narrowing or absent joint space mean that you have developed hip arthritis. I agree with the surgeon who told you that at some point in the future, a total hip replacement will be appropriate. I also agree with the advice that it will be appropriate for you to proceed when you personally feel disabled and frustrated enough. This is a decision you’ll make within your heart and with your support group. My strong advice is to focus on choosing the particular surgeon who will perform your surgery and then trust that individual to select the surgical approach and specific prosthesis which they feel has the best chance of giving you the best result. This is the really important part, the rest is marketing. I am a 56 yr old woman who greatly needs help. I had a right total hip arthoplasty in Nov, 2011.
showed: small effusion in left hip joint space. Cartilage loss of both hips, right greater than left w/ osteophyte formation suggesting osteoarthritis. No avascular necrosis seen. No bursitis or tendinitis. Impression: Advanced right hip degenerative osteoarthritis, arthroplasty level. Now in his Operative notes: Examination of femoral head revealed extensive cartilaginous consistent with post traumatic osteoarthritis . Fast forward to today, 11/2016. I have been experiencing deliberating pain. It hurts so bad, deep pain right under scar. Getting lower back pain on side of hip replacement and a little buttock right pain if I sit too long. I went to see a Orthopediac Surgeon ( my original Surgeon moved to Mass.) who took a X-ray and said he didn’t really see anything. Sent me to Dr Bernard Roerh, who didn’t even look at my scar, press on it…. He set up a Bone Scan for tomorrow ( 12/2) . The last bone scan that I had about 5 yrs ago showed I had Osteopenia. I am so scared this new Bone Scan will show nothing is wrong with my hip. I have only experienced this god awful pain after the hip replacement. I do have R. S. D. and get treated at a pain Clinic. The hip Dr I went to just sat in a chair and said ” well you might chalk this up to RSD or a pinched nerve. I ABSOLUTELY know it’s not RSD. It is a whole different kind of pain and my Pain Dr ( a well known Anestheologist) agrees. He has been treating he since my MVA( 1995). He did wonder if I had Bursitis, but after several shots, he ruled that out. I have had hip joint shots/ cortisone … shots. No relie. I am so scared thus new Hip Dr, if he sees nothing on the Bone Scan, he is just going to say it’s RSD. What should I do? Nothing helps this pain and it’s all day long. I also take strong pain Meds for RSD & Fibromyalgia ( Elavil. Mehodone, 800g Neurontin, Diluad, Miraoex)and it spdiesnt touch this pain. I had a hip replacement in 2011 and about a yr later, I have pain that is so extremely deliberately & getting worse. It is deep pain right where the scar is & I get lower back pain right above the hip. I do have R. S. D. from a MVA and gets treatment from a wonderful Pain Clinic. And I am in strong pain Meds for RSD and Fibromyalgia. ; Methodone, 800 mg Neurontin, Dilluid, Elavil& Klonopin. They don’t even touch this pain. I have had a lot of surgeries from my MVA and never had pain afterwards, so I do know the outcome of surgeries. This pain has taken over my life. I can’t work, Can’t walk far, crawl upstairs vs walking up and the pain is 24/7. The Dr didn’t seem to concern. I am getting a bone scan tomorrow. The Dr kept saying” it might just be RSD. Your doctor is trying to rule out a definable and treatable cause for you pain. Your diagnosis of FMR and your narcotic addiction does make it much more difficult to sort this out. I suggest you continue to follow you physician’s recommendations. If a specific problem with the prosthesis can be ruled out and RSD is suspect, then hopefully that can be treated with specific nerve blocks and meds.